Pixar Animation Studios, the creator of TOY STORY 3, whisks you away on an astonishing adventure to an ancient land full of mystery and tradition. 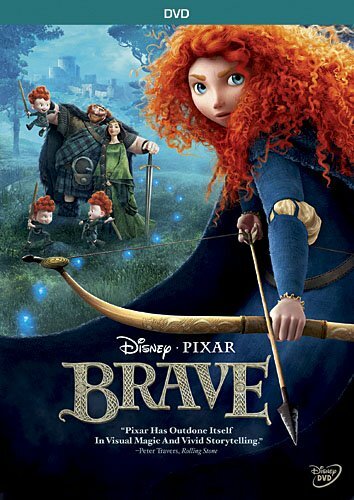 Bursting with heart, unforgettable characters and Pixar's signature humor, BRAVE is "a rousing, gorgeously animated good time," raves Peter Travers of Rolling Stone. 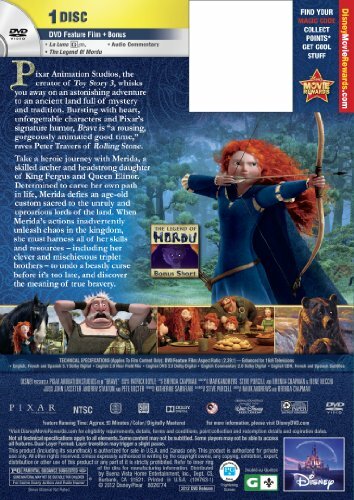 Take a heroic journey with Merida, a skilled archer and headstrong daughter of King Fergus and Queen Elinor. Determined to carve her own path in life, Merida defies an age-old custom sacred to the unruly and uproarious lords of the land. When Merida's actions inadvertently unleash chaos in the kingdom, she must harness all of her skills and resources -- including her clever and mischievous triplet brothers -- to undo a beastly curse before it's too late, and discover the meaning of true bravery. Brand Name: Ingram Entertainment Mfg#: 786936813111 Shipping Weight: 0.17 lbs Manufacturer: Genre: CHILDREN/FAMILY All music products are properly licensed and guaranteed authentic.